Bangkok (Thailand) – June 1, 2018 (travelindex.com) – Siam Piwat Co., Ltd., the joint venture partner of ICONSIAM as well as the owner and operator of prestige retail developments such as Siam Paragon and Siam Center, has just been presented the world’s most prestigious retail development award for the concept and “cutting-edge design” of its Siam Discovery retail destination by the world’s largest retail development association – the International Council of Shopping Centers (ICSC). 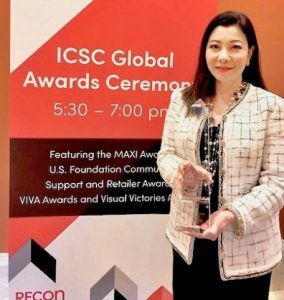 In a dazzling awards ceremony organized in Las Vegas, USA, Siam Discovery rose to take the top spot from among hundreds of projects from around the world competing to be the winner of the ICSC’s VIVA Award. The ICSC’s VIVA Awards are presented, annually, by an independent expert jury to “recognise the best-of-the-best in the world of retail development”. Siam Discovery opened its doors to visitors in 1997. It underwent a Bht 4,000 million re-build and reopened in 2016 as Thailand’s largest lifestyle specialty store and ‘the biggest arena of lifestyle experiments’. During the past 2 years, Siam Discovery has swept 6 global awards from prestigious competitions in the world of retailing. Among them is the World Retail Awards part of the World Retail Congress Global Series – Store Design of the Year 2017, for being world’s best designed development. Siam Discovery was also chosen by the International Council of Shopping Centers to be the winners of the Gold Award – Design and Development Excellence Renovations/Expansions, for being Asia Pacific’s best designed development, as well as the Gold Award – Marketing, Positioning & Brand Awareness, for being the project with the best execution in marketing, positioning and brand awareness in Asia Pacific. “Siam Discovery is a game-changing, hybrid retail destination where products, services, and activities are brought together in a way that suits the lifestyle of Millennials. Products are grouped without the constraints of a particular brand or school of design, in a way that puts the needs of the customer at the centre. Millennials want to discover their own style while exploring new experiences with other people. Here, they can experiment and discover what they like and what expresses their own identity best,” Mrs. Chutrakul said.